For 3½ weeks I haven’t driven, chopped herbs, sifted, stirred or baked. For nearly a month now, not a load of laundry, a trip to the mailbox or a bill paid. No garden tended, no floor swept, no counters wiped clean. Familiar comforts, left behind. Rhythms and patterns, well-established, set aside. In exchange, there was to be newness in every step. “Knowing” suspended. Curiosity indulged. No apron. But a heavy camera around my neck. And from my shoulders, a weighty loaded pack. Miles upon many miles of footfalls, blistered and tired (but ever-willing) feet. Ears perked. Eyes wide. Body stooping, reaching, climbing. And a bursting happy heart! And now, it’s home again, home again. Happy to be. I’ve so much to share with you, but need a day or two first to gather it together. and always & ever (you know) Food! Did you take that photo? I love the cobble stone road, old buildings, with just a touch of color in the plants. Excellent! Looking very much forward to the upcoming shares! And welcome home! What a perfect vacation. I can’t wait for pictures. I love you, my sister! Twas nearly perfect Claudia, even more than I’d hoped for! and I love you too dear sister! Welcome home, Spree, I’ve missed you! Looking forward to hearing about your travels. I’ve missed you too Mar! Thanks for the welcome! My senses need fulfillment. Looking forward to photos and gustatory delights. It is going to be SUCH my pleasure to hope to satisfy your senses! Stay tuned, Pete! a surprise encounter with fresh green on a well-established path of stone-certainty! I appreciate your welcome! Thank you! Simply can’t wait Boo Boo 🙂 Glad you had an awesome trip! Bring on the pictures! I’m excited! Thanks for the wonderful pic. I couldn’t access the text. My own dear Mama! I was so happy to see a comment from you! And then, oh no, what’s gone wrong…I’ll call you! 🙂 We’ll get this figured out! love you! Hah! back where I belong eh? 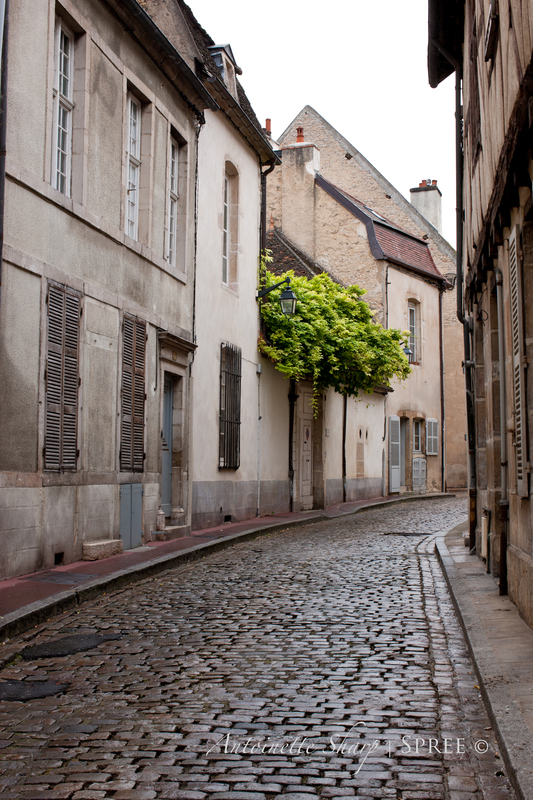 And all that time I was believing I belonged in the rolling countrysides and cobbled streets of France! 🙂 Thank you John, we had such a good time away and I appreciate that you’ll let me share it with you! Let me just join the chorus of those welcoming you home. I too anticipate seeing your pictures and hearing your stories. i just KNEW you were a cheerleader Ronnie! Looking forward to seeing the pictures. I did wonder where you’d got to. That street could be in our nearby village in the rain this morning. Roger, many times on this trip, with my camera pressed to my cheek, I wondered: wouldn’t Roger think this was a rather “ordinary” scene? I was repeatedly stunned by the well-worn and “ordinary” beauty of it all! How lucky for you that your eyes can feast on that at will! Welcome back – it´s good to travel but it´s also wonderful to be home again isn´t it?! Ha, I thought you were on your travels, that is what happens when you read posts back to front! So welcome home!! Europe on foot is th ebest way to go, despite tired feet, it really is my favourite way to see it all!